The continuous improvement of device build quality and components, coupled with higher price tags, has motivated consumers to hold on to their smartphones for longer periods than in the past. According to the latest Mobile Connectivity Report from NPD Connected Intelligence, the average U.S. smartphone upgrade cycle is 32 months, up from 25 months one year prior (2H 2017 vs. 2H 2016). Over the same time period, the percentage of smartphone users holding on to their smartphones for over three years has increased from 18 percent in the second half of 2016 to 22 percent in the second half of 2017. 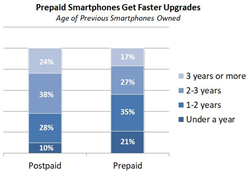 The prepaid segment has historically recorded the shortest upgrade cycle, due in part to affordable pricing and high churn. In the second half of 2017, 21 percent of prepaid smartphone users reported upgrading their devices within a year of purchasing their phone, this compares to only 10 percent of postpaid consumers. The results of the NPD Group Connected Intelligence Mobile Connectivity Report are based on consumer panel research that reached 3,600 U.S. cellphone users, aged 18+ from diverse regions and demographical backgrounds. This survey was completed in February 2018.